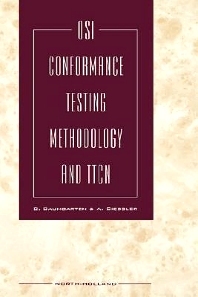 An overview and a critical review of the Conformance Testing Methodology and Framework is provided by this book. This standard, ISO/IEC 9646, describes a methodology for testing implementations of Open System Interconnection (OSI) specifications. It is widely used by protocol and profile specifiers to help them specify their conformance requirements unambiguously and to provide proformas for suppliers to fill in to clarify which capabilities their products support. The standard is also used by test specifiers to define how to specify OSI conformance tests and to give guidance to test system developers. Further, it is used by test laboratories and the relevant accreditation bodies to define how an OSI test service should be operated. Finally, it is used by other testing methodology specifiers to serve as a guide on how to write testing methodology standards. The publication, which will serve as a definitive textbook on the subject, enables readers to understand existing test documents, especially test suites, and aims to assist them in producing their own documents. Introduction. Software Testing. Distributed Systems. Communication Protocols. Standardization Work on Testing Methodology. Interoperability Testing. The OSI Conformance Testing Methodology. OSI Conformance Testing Projects. The Field of the OSI Conformance Testing Methodology. General Concepts. Testing Documents. Abstract Test Methods. Abstract Test Suites. Test Realization. The Conformance Assessment Process. TTCN - The Static Parts. Conventional TTCN and Concurrent TTCN. TTCN.GR and TTCN.MP. TTCN Test Suites. Definitions and Declarations. Constraints. TTCN - Behavior Descriptions. Fundamentals of Test Case Behavior Description. Behavior Tables. Psuedo-Events. Event Behavior Lines. Constructs and Defaults. Verdicts. Global Aspects of Test Suite Execution. Questions of TTCN Style. PCO Problems. Test Documents for an Example Protocol. The EXPRO Protocol. EXPRO Test Suite Structure and Test Purposes. The EXPRO PICS. A PIXIT for EXATS. The EXPRO Abstract Test Suite EXATS. Annex A: The BNF Rules for TTCN. Annex B: An Overview of Test Tools. Annex C: List of Abbreviations. References. Index.